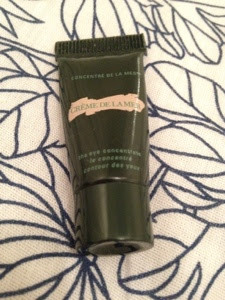 I've always been curious about Creme de la Mer products. They get excellent reviews but the extremely high end prices scare me off. 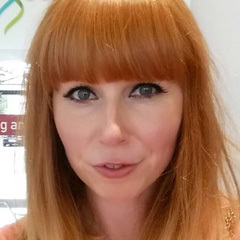 I was lucky to be given a small sample of the eye concentrate after a discussion with the counter assistant in Harvey Nichols a few weeks back and delayed using it as I was a bit frightened about falling in love with it given its £125 price tag! The cream is a really thick liquid and luckily a little goes a long way. To give you an idea, the 3ml sample I have has lasted about 2 weeks with me using it once a day at night. It has a slight herbal scent but it's not overpowering at all. It feels very rich to the touch and goes on very smoothly. It sinks in quickly and leaves the eye area feeling soft and well moisturised. I've used this as a night cream for my eyes and have woken up with fresh looking eyes each day. As much as I don't want to like it because of the price tag, I'm actually quite impressed with it. If it were slightly more affordable or money was no object then I would definitely buy the full size. For now though, it's been a lovely luxury to try, but I'll be going back to my stash to find a cheaper alternative! I love all the Creme de la Mer products - though I've only had samples. Doing a project pan on moisturisers - once I get through them I'm buying a CDLM moisturiser! That is such a good idea. I would love the full size eye cream. How close are you to getting through your stash?